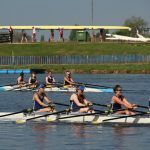 After not being able to compete at BUCS Regatta last year due to issues with the entries, USBC was excited to finally compete at the regatta this year. Over the last two years, the club has progressed a lot towards a high-performance environment. Therefore, the whole squad, consisting of 30 athletes and 2 coaches, was buzzing to show what we have been working on. 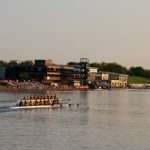 After arriving at Holme Pierrepont in the evening of Friday the 5th of May, some of the crews went out for a pre-paddle. 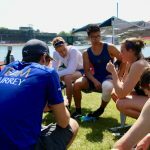 Thereafter, the coaches gathered the athletes to go through the plan for the upcoming days, including establishing routines to make everything go smoothly. After a good nights sleep, in the morning of Friday the 5th of May 2018, USBC was ready for the first big day of racing. 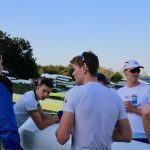 The majority of the squad was racing, but the club could count on the rest of the squad to help out with boating, rigging and supporting the team alongside the race course. 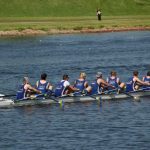 Entered were a men’s beginner four, two women’s intermediate quads and a men’s intermediate eight. 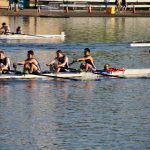 The first to time trial was the beginner men’s coxed four whose first regatta this was. Following a warm-up on the ergs, Lukas Schroth, Roberto de Isidro, Chris Homes and Wei Shen Chin coxed by Fiona Norris boated with the help of the rest of the beginner squad. Rowing up to the TT, it was some of the best rowing the crew had done according to coach Iona Riley. 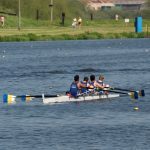 Without knowing what to expect, as they had only been out in the four a couple of times, they put all their power down over 1500m and reached the A/B- semi-finals. All of them were very happy with their race and buzzing for the rest of the day. Second to time trial were the women’s intermediate quads. 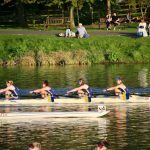 The B quad consisting of Lizzie MacCann, Sophie Hossack, Anika Piezka and Naomi Coleman were drawn to race before the other crew. After their pre-paddle in the previous evening, the crew came together better as they had not been out often, due to members of the crew being on placement away from the university. They took this confidence into their time trial and proceeded to have a great race. The spirit in the crew was high as it was the first BUCS regatta for three of the girls and they had a lot of fun during the time trial. They progressed into the D- finals. Shortly after, the A quad consisting of Maddie Gardner, Ellie Stevens, Megan Moloney and Jasmine Bone were time trialling. The girls had a strong paddle up to the start of the race. Having worked together in the quad since Peterborough, the crew knew what they had to do and executed their plan very well. They made it into the A/B semi-finals. The last Surrey crew to time trial was the men’s intermediate eight, who found together quickly after pre-paddling the previous day. Giovanni Morescalchi, who has coxing experience from the world rowing championships, coxed the men with passion. Ludovico Iannizzotto Venezze, Ali Douglass, George Stewart, Mantas Volkauskas, Alex Law, Kieran Dibley, Ben Radcliffe-Brown and George Glenister had a good race and also made it into the A/B semi-finals. The semi-finals were held in the early afternoon. The break was spent in the shade of the club marquee and with food to fuel up for the upcoming semi’s. The MBeg4+ were the first ones to take onto side by side racing. 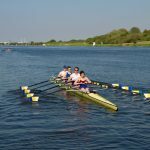 Having done pieces against Peterborough Rowing Club while on Easter camp, the boys had an idea of how it would be, nevertheless it was big for them to be racing other top crews. Out of the semi-finals they progressed into the B-final in the evening. Thereafter, the women’s intermediate A quad had their race. Due to minor issues with the blades which was nerve-racking for the crew, they were running late for the start of the race. Nevertheless, the adrenaline pushed them on to put down a great performance. They came fourth in the semi-final, which meant they progressed to the B final as well. The Mint8+ had tough competition for their semi-final. They stormed down the racing course and also progressed to the B-final. Not long after the semi-finals, the women’s B quad raced their D final. 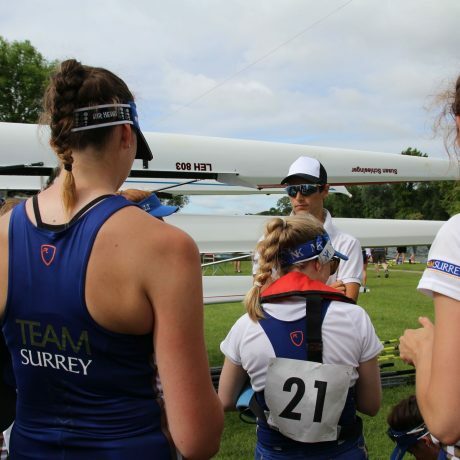 Stepping on from their time trial and after a chat with head coach Samuel Tuck, the crew had a good race and eventually came fourth. Placing them overall 22nd in the country. The men’s beginner four embarked on their final race for the day accompanied by both coaches. Iona Riley prepared them mentally on what was to come. Motivated to improve from the semi-final, rested and fuelled up, the boys went half a minute quicker in the final. They overall placed 10th in the country out of 44 crews. The quad had a better boating experience and took that into their final. With a quicker race than in the semi’s, they placed second in the B-final ranking them 8th in the country out of 35 crews. The intermediate men’s eight took all the good results into their race. Led by an Italian spirit they scraped off a couple of seconds from the semi and proceeded to place 12th out of 43 crews. Overall, the whole team was happy with the first day of BUCS regatta. Especially, seeing the two-year progress, the whole club has changed. The results were good along the board, in particular in comparison to previous years. The first day left the squad hungry for more and motivated by how well the racing was going.